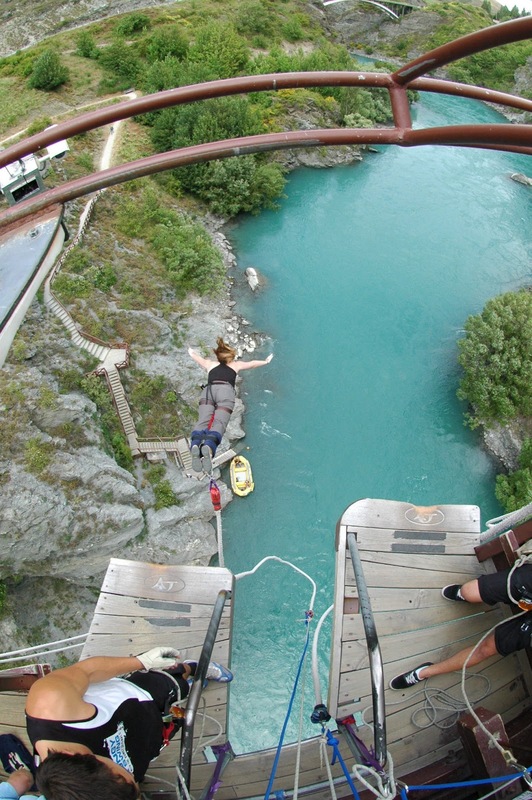 Kawarau Bridge, the birthplace of commercial bungy. In Queenstown, NZ, the question of greeting in hostel common rooms isn't the usual "So, how long are you staying?" or "Where are you from?" Instead, without fail, it's "What are you doing tomorrow?" I loved Queenstown from the moment I drove into it, more in spite of its adrenaline-junky status than because of it. It comes closer to picture-perfect than any other town I've seen, and its gorgeous setting certainly doesn't hurt, with stunning views and a staggering range of outdoor adventures on offer. Queenstown was the last stop on the solo portion of my road trip around New Zealand and I'd already done most of my thrill-seeking for the trip; the only thing left was bungy-jumping. 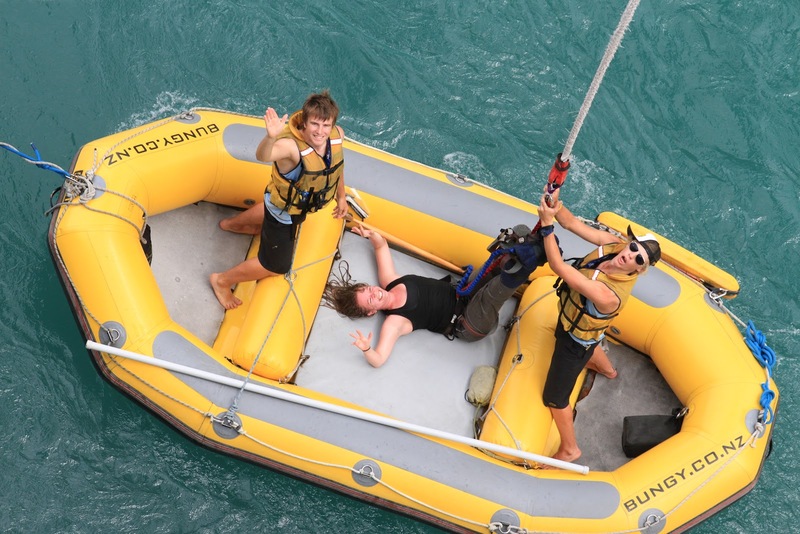 If I had a bucket list, bungy would not be on it - as I've said before, I am not an adrenaline junky. 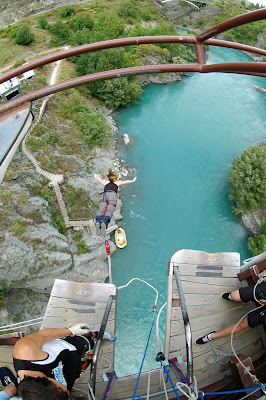 But Queenstown is the birthplace of commercial bungy and if I was ever going to hurl myself off a ledge with no more support than a glorified rubber band, I figured there was probably no better place for it than where it all began. In the interest both of budgeting and not giving myself a chance to back out, I booked my non-refundable jump date online well before I arrived in New Zealand. Still laughing - I hadn't actually looked down yet. Upon arrival, I tightened my sandals and pulled off my watch and earrings, laughing at the "I Was Too Chicken" shirts on display in the gift shop. In a brilliant flash of self-preservation, I decided I didn't want to wait around watching people jump first, I just wanted to do it. I was second in line out on the bridge, joking with the British guy behind me while I climbed down onto the back part of the ledge to have my legs wrapped and secured. I told the guys operating the jump that I wanted to touch the water (the options are bungy over it, touch it, or get dunked), and waddled forward when they told me to. Distracted by the guy telling me to look at various cameras, I didn't actually look down until they were resetting one that hadn't gone off the first time. All of a sudden, my heart leapt into my throat. I was supposed to voluntarily hurl myself into all that thin air, when every instinct was screaming to back up - very quickly - onto safer ground? I gulped. going to get far enough from the platform. The reset camera flashed, and the operator, thoroughly unimpressed by the feat of sheer insanity he was about to witness, began to count down from five. Much, much faster than I thought he should be counting. Jittery thoughts rushed through my brain. How am I supposed to do this? Who in their right mind is actually capable of jumping off a ledge? This is freaking terrifying. As he reached "three," one thing became clear: If I don't go when he says "one," I'm never going to get off of this thing. I took a deep breath, braced myself and, as he finished the countdown ("...one. Bungy! "), threw myself forward, arms outstretched. There was a split second of weightlessness, of absolute freedom, and then I abruptly realized that my stomach was still on the ledge, while the rest of me was hurtling downward, much too quickly. The water of the Kawarau River, rushing up at me, was a gorgeous color and I stretched my hands toward it, not wanting to miss my shot to dip my fingers in. Except, I realized, my brain still moving at warp speed, that a whole lot more than my hands was about to get wet. I quickly clamped my mouth, open from shrieking on the way down, tightly shut, but didn't manage to get my eyes closed before I was submerged in that gorgeous blue, the color forever imprinted on my brain as it swirled around me. I surfaced almost before I'd had a chance to register the freezing temperature of the water and bounced around like a yo-yo (somehow also managing to spin myself around in dizzying circles) until the retrieval raft got close enough to reel me in. I lay on the bottom as they untangled me and floated us to the stairs, laughing as I stared back up at the bridge. Soaking wet, but safely down. Safely back on the viewing platform, I watched some of the other jumpers and was very glad I hadn't taken the time to do so before jumping myself - it was positively terrifying to watch. Waiting for the bus back into town, we all swapped photos and brandished our "Bungy Jumper" t-shirts. My head was starting to ache, but I put it down to the cold water and too much post-jump shivering, which was more in reaction to the jump than the temperature of the water. Back at the hostel, I told my "accidental dunking" story and called my parents to let them know I'd survived my last crazy stunt of the trip, before making my way back to my room. I'd braced my pack at the foot of my bunk, against a full-length mirror; glancing into it as I pulled out dry clothes, I gasped. No wonder I had a headache, the skin underneath my left eye was swollen and the lid was starting to bruise! Since I hadn't asked to be dunked, I hadn't tucked my chin the way you're supposed to and my face had slapped the water as I went in, giving me my first-ever black eye. Despite the black eye (which I walked around feeling self-conscious about for the following week), I'm glad I took the plunge, so to speak. Bungy-jumping was a once-in-a-lifetime experience that I have no desire to repeat but definitely wouldn't have wanted to miss. And it's certainly the most extreme - and unique - travel misadventure I've ever had. After all, how many people do you know who've been punched in the face by a river? Thanks, that was the idea! I tried "The Ledge" in Queenstown. Like you, I have no desire to repeat the experience. Actually, I hated because it was so frightening! Yikes, that one looked scary - I kept staring at it on my way up and down the Skyline Gondola, wondering how anyone managed to do it without smashing into either the side of the hill or the trees. Good on you for doing it, even if it was terrifying!